The neoclassical "Arhontiko" Evgenia traditional rooms and studios provides to the visitor all the modern comfort and it is only 10 minutes walk on foot away from the centre of the city of Chania, the Market, the commercial stores, the public services, the bus station, the museums and near to a beach. Around us there are mini-markets, cafeterias, taverns and restaurant and everything else you desire for your accommodation and your entertainment. 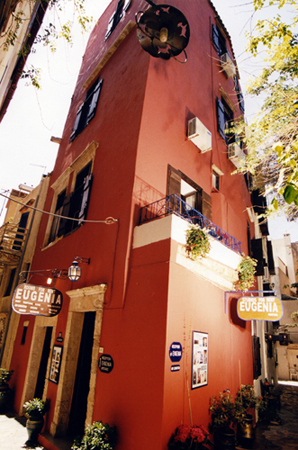 The hotel is situated in a quiet narrow paved street which assure you a quiet sleep and undisturbed relaxation. Check in: 13:00h (arrival before 13:00h it can be arranged after discussion with the manager the day before). Check out: 12:00h (to use the room until 18:00h customer will be changed the 50% of the hall amount. After 18:00h the client has to pay the hall amount. Exception: no charge after discussion with the manager case the room is free for the next day). Our website was upgraded on March 2012. We have been running the hotel from 1992 with constant renovation and experience on the area of the tourism. Because of the small number of the rooms we would like to ask the clients to confirm their reservation as soon as possible, to avoid any misunderstanding. We kindly request our clients to inform through telephone call the hotel manager for approximately time of their arrival in the city of Chania. Our purpose on that is to help you and guide about how to arrive to the hotel and welcome you anytime. In our prices are included all services and you have no extra charges.